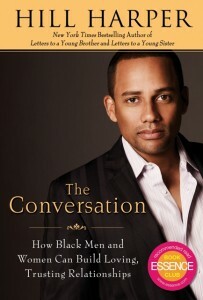 Hill Harper’s book about relationships is a perfect kick off for a fall book club! The book is called “The Conversation” because it’s really about communication. How can we be more honest with ourselves? How can we take that first step towards getting what we most want/need out of our relationships: true, authentic connections. It’s a great read, sure to provoke some heated discussion. Hill Harper (who stars on CSI and was a classmate of Obama’s) has fascinating insight into the unique problems facing single African Americans as they seek their soul mates. But the advice and issues he addresses are universal. We all face myths and stereotypes and engage in self sabotaging behavior. Even those of us that are already married! This book seems to be a well spring of good, common sense advice. It’s definitely a conversation starter!